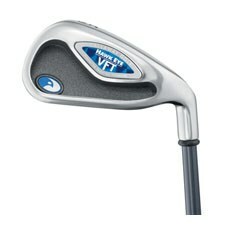 VFT is an acronym for Variable Face Thickness, and is a patented feature from Callaway. This feature allows Callaway to fine-tune the performance of every club throughout the set, maximizing the performance characteristics of each iron to its intended purpose. The Hawkeye VFT features a long, internal weight pocket that extends the weight distribution further across the face of each iron, allowing for more forgiveness on off-center hits and keeping the ball headed closer to your intended goal. With a compact head size (within the game-improvement club category) and thinner top-line in the titanium head, these irons will appeal to many players. Callaway has also redesigned the 360° undercut channel on the back of the Hawkeye VFT, which allows them to position the center of gravity precisely in each iron through the set. The Hawkeye VFT irons cover nearly every option a golfer could imagine. Available in sets (3-PW) and individual 1 and 2-irons as well as Sand, Lob, and "A" wedges, they were produced in both right hand and left hand orientations. There are two shaft options to choose from, both Callaway OEM exclusives: System 75 Ascending Mass Graphite Shaft (Light, Regular and Firm flex) or the Callaway Uniflex Steel Shaft. Although the Callaway Hawkeye VFT clubs were produced in 2002, they are widely available in used sets or individual irons from a multitude of online merchants.